A tale of desire, obsession, and deadly mystery, with echoes of Vertigo. Dr. Caleb Maddox is a San Francisco toxicologist studying the chemical effects of pain. After a bruising breakup with his girlfriend, he is drinking whiskey at the speakeasy House of Shields when a hauntingly seductive woman appears by his side. Emmeline whispers to Caleb over absinthe, gets his blood on her fingers, and then brushes his ear with her lips as she says goodbye. He must find her. As his search begins, Caleb becomes entangled in a serial murder investigation. The police are fishing men from the bay, and the postmortems are inconclusive. One man vanished from House of Shields the night Caleb met Emmeline. When questioned, Caleb can't offer any information. But he is secretly helping the city's medical examiner, an old friend, understand the chemical evidence on the victim's remains. Caleb's search for the killer soon entwines with his hunt for Emmeline, and the closer her gets to each, the more dangerous his world becomes. 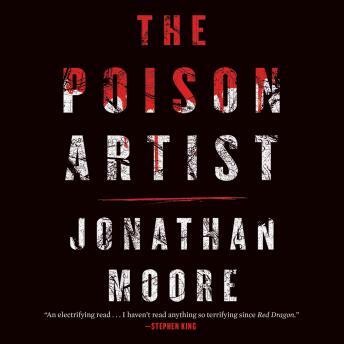 The Poison Artist is a gripping literary thriller about obsession and damage, about a man unmoored by an unspeakable past and an irresistible women who offers ultimate escape.